Some people feel that saying “yes” is kind, polite, and fair. Others feel that it’s easy and less confrontational, or that they’re following the path of least resistance. The reality, however, may be contrary to such conventional “wisdom.” Just think what all your “yes” answers are doing for you — you have time for everyone, except the people you care for most; you have to stay late because you’re helping everyone else do their work; you try to keep everyone happy, even though it’s making you miserable; you agree to go out every night, even though you’re close to exhaustion. Don’t feel guilty…Just say no! Priorities. When you’re hijacked by other people’s priorities, you don’t have time to tackle your own. Make your priorities a priority. Personal values. Hold firm to your beliefs and values. When you succumb to peer pressure, you may live to regret it. Focus. If you try to be good at everything, you’ll end up being mediocre at everything. Balance. Stop trying to fill your calendar each day. Happiness is a result of balance rather than intensity. Productivity. Just because some people waste their time doesn’t entitle them to waste yours. Shortcuts. Don’t allow yourself to be talked into every harebrained idea. Get-rich-quick schemes rarely pan out in the long run. Appetite. Be grateful for the things you have in your life rather than being obsessed with more. Resource allocation. Concentrate your resources rather than making across-the-board decisions. Attitude. When you allow negative and unethical people to pollute your thoughts, you’re forced to carry a heavy load. Carefully choose the people with whom you associate. Conscience. Never let anyone persuade you to compromise your integrity. Listen to your conscience. That’s why you have one. Happiness. 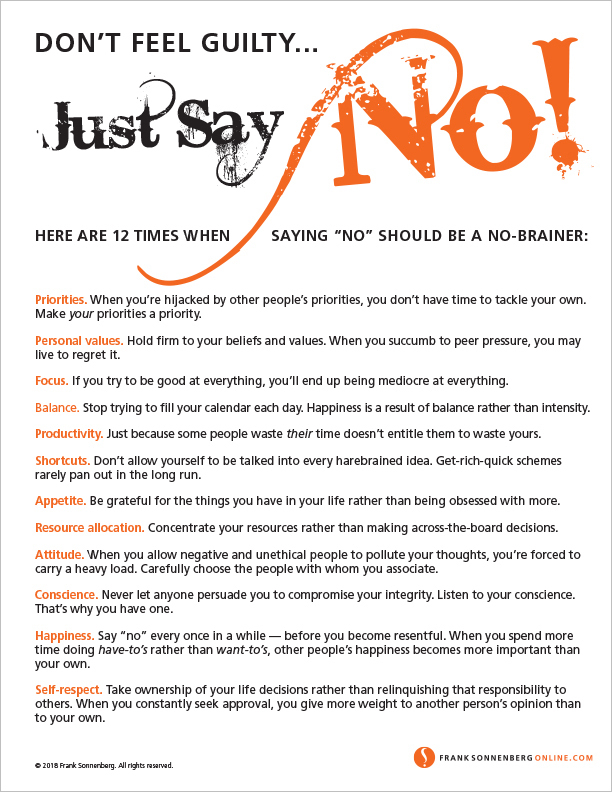 Say “no” every once in a while –– before you become resentful. When you spend more time doing have-to’s rather than want-to’s, other people’s happiness becomes more important than your own. Self-respect. Take ownership of your life decisions rather than relinquishing that responsibility to others. When you constantly seek approval, you give more weight to another person’s opinion than to your own.